Today’s business pressures require IT resources to be a cost-effective mixture of public and private cloud resources. Consequently, IT infrastructure and operations (I&O) professionals need to rethink how they design, deploy, and manage IT services in a way that seamlessly combines internal resources and public cloud platforms into a single platform. Under the old static IT model, security, reliability, and scalability have been fundamental pieces to connecting business resources; however, as IT shifts to creating a hybrid cloud platform, questions arise as to what new demands will be placed on the network. 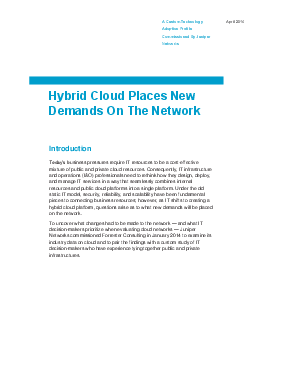 To uncover what changes had to be made to the network — and what IT decision-makers prioritize when evaluating cloud networks — Juniper Networks commissioned Forrester Consulting in January 2014 to examine its industry data on cloud and to pair the findings with a custom study of IT decision-makers who have experience tying together public and private infrastructures.